Sue McGee has been dealing with quite a lot. Thankfully, she has a wonderful support system to help her through these difficult times. “Here’s the story. A while back, my Mom had a routine colonoscopy. During it they found a few polyps that had to be removed, which was no big deal. They had also come across a larger one which they were concerned about. So, they went ahead and did a surgery to remove and do a biopsy of it. The first doctor who removed it said it was a SUCCESSFUL surgery and they found cancer in the mass. But, said they removed it. We were so relieved. A couple of months later, she still wasn’t feeling right and had a hard time healing. So, she went back to get it checked out, had a bad experience and felt led to get a second opinion. She went to a recommended doctor out in Rochester. This doctor went ahead and checked her out herself. This is where they found the colon cancer. Stage 3. Her new doctor is very hopeful about it. Right now she is receiving chemotherapy once every other week out in Batavia. 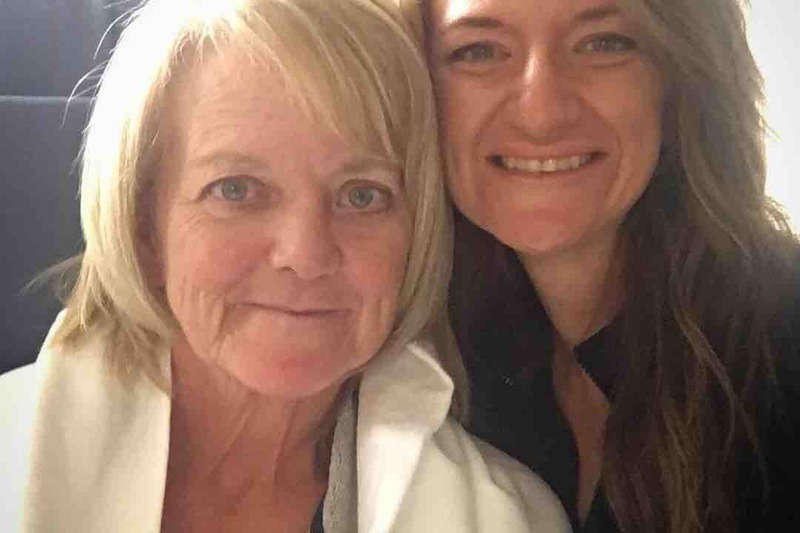 She gets a round of it for about 3.5 hours at the facility and then once she’s home, a home nurse comes by and hooks her up for another 46 hours. The plan is to have 6 treatments of this, have an MRI done and the doctors will discuss where to go from here. Whether or not to give her more chemotherapy, go ahead with radiation and/or surgery to remove what’s left. On top of all of this going on, she needs some repair done to her house, along with dealing with her trigeminal neuralgia. The medical bills are really starting to add up. She’s literally THE strongest woman that I know. HERE IS A LINK TO SUE’S GOFUNDME SITE. The truth is, every little bit does help. It all adds up – so whatever you can give is very much appreciated by Sue’s family. If you can’t give – which is totally understandable – perhaps sharing her story will help someone else to give. Either way, keep Sue in your prayers. 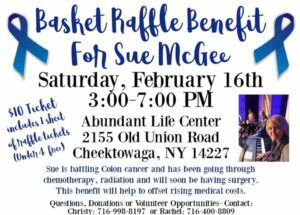 There is also A Community Fundraiser planned to help offset costs of medical bills. WHEN: Saturday, Feb 16th from 3-7 pm.